Lord, thou deliveredst to me five talents: behold I have gained other five. O Almighty and eternal God, who, by a wonderful providence, makest choice of the weak things of this world to confound the strong; mercifully grant, that, being perfected in all humility, we may be raised by the prayers of thy holy Confessor, blessed Didacus, to the everlasting glory of heaven. Through our Lord Jesus Christ, thy Son, who liveth and reigneth with thee, in the unity of the Holy Ghost, God, world without end. Amen. Let us read the luminous life of this unlearned man, as given in the book of holy Church. Didacus was a Spaniard (this name is merely a Latin form of the Spanish Diego, i.e. James), born at the little town of St. Nicholas de Porto in the diocese of Seville. From his early youth he began the practice of a perfect life, under the guidance of a pious priest in a solitary church. 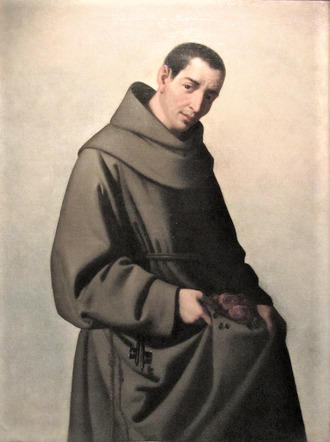 Then, in order to bind himself more closely to God, he made profession of the rule of St. Francis, in the convent of the Observantine Friars Minor at Arizzafa. There he bore the yoke of humble obedience and regular observance with great alacrity; and devoted himself especially to contemplation, in which he received wonderful lights from God, so that, illiterate as he was, he spoke of heavenly things in an admirable manner, evidently by a divine gift. He was sent to the Canary Isles to govern the brethren of his Order; and there he had much to suffer. He was burning with the desire of martyrdom; and by his words and example, he converted many infidels to the faith of Christ. Coming to Rome in the Jubilee year, in the pontificate of Nicholas V, he was entrusted with the care of the sick in the convent of Ara Cœli. With such loving charity did he acquit himself of this duty, that the sick wanted for nothing even during the famine in the city; he also sometimes cleansed their ulcers by sucking them. He was remarkable for his great faith and his gift of healing; for by signing the cross upon the sick with oil from a lamp burning before an image of the Mother of God, to whom he had the greatest devotion, he miraculously cured many of them. At length, when at Alcala, he understood that the end of his life was at hand. Clad in an old torn tunic, with his eyes fixed on the cross, he devoutly pronounced these words of the sacred hymn: O sweet wood, sweet are thy nails, and sweet thy burden; thou wast worthy to bear the King and Lord of heaven! He then gave up his soul to God, on the day before the Ides of November, in the year of our Lord 1463. His body was left unburied for several months, in order to satisfy the pious devotion of the numbers who came to see it; and, as though already clothed with immortality, it exhaled a sweet odor. He was renowned for many striking miracles, and was enrolled among the Saints by Pope Sixtus V.
St. Didacus, pray for us.